These personalized cupcake boxes are a cute way to display your cupcakes and give guests an easy, take-home favor they will actually love. Each 3 x 3 inch white cupcake box hold one standard sized cupcake and is custom printed with two lines of text. Great for graduations, weddings, baby showers, birthdays, bridal showers, and so much more. Present your boxes at a dessert table for guests to grab or set a box at each guest place setting. Each box measures 3 inches square. The front of the box includes a see through cellophane window so guests can see what is inside. The top of the boxes fold closed to form a handle for easy carrying. Have one line of text printed above and below the window in your choice of lettering and imprint color. Everyone loved the cupcake favor boxes! They made sure the product was delivered on time as promised. Thank you. 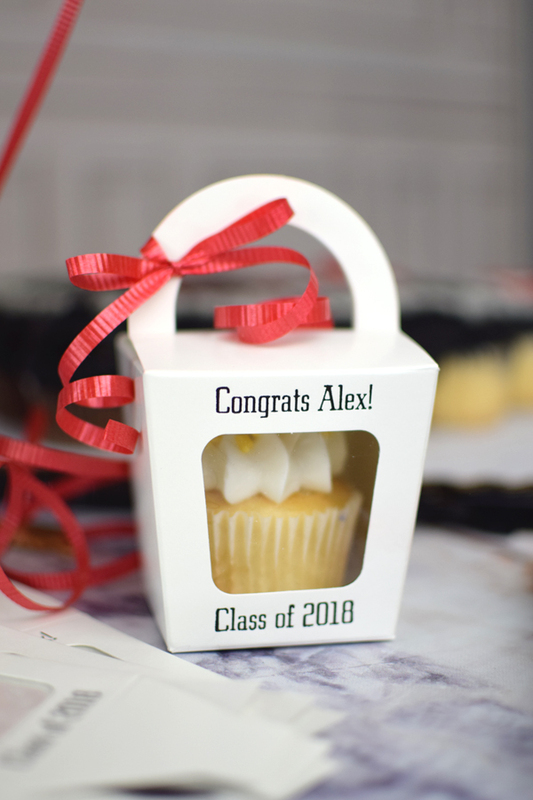 These cupcake holders are a great idea for graduation. They are super cute! They shipped quickly and IÃ¢â‚¬â„¢m very happy with this purchase. Completely satisfied with cupcake boxes. Perfect for Grandsons graduation Thank you!